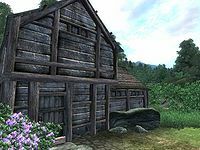 The Sleeping Mare is a small inn located in the town of Pell's Gate. The publican, Candice Corgine, has no gold and a leveled Mercantile skill, which makes her useful for bartering only after you have invested in her. When bartering, she will buy potions and food while selling alchemy apparatus, potions, soul gems, and ingredients. She should have been able to rent rooms but doesn't, due to a bug. The ground floor contains the reception area, which consists of a counter, and the dining room while the rooms are upstairs. The room that you can rent is the first to the right; it is small and dark, and only contains a bedroll and a chest. If you pick the lock or open it with its key, you can enter the other room although you won't be able to sleep in the bedroll, as entering counts as trespassing. Candice is one of the few leveled merchants in the game, causing her to gain 1.5 points of Mercantile skill each time her level increases. Therefore, her Mercantile skill at any point in the game will be 30+PC*1.5. Candice won't rent out rooms. Although Candice is a merchant, she has zero gold available to buy items; if you want to sell items to her, it's best to wait until you can invest in her store. Esta página foi modificada pela última vez à(s) 21h56min de 22 de julho de 2013.